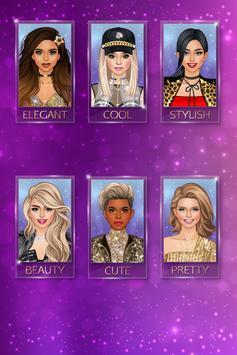 A new game for girls and gals with interest in styling, makeovers, apparel industry, celebrities, top models and superstars. Style 6 dolls of all races with over 200 clothing items in their ridiculously expensive, luxurious wardrobes. Put together glamour looks for every supermodel. Young fashionistas will come with come up with great designer ideas: pick a fancy hairstyle, a beautiful dress, and some trendy accessories to create a unique outfit for each girl. 8 backgrounds set up the context: catwalk, red carpet, photo session at a studio, beauty & fashion magazin cover, tropical resort, mall, boutique, beauty salon, and fashion show. Find more makeover apps and cosplay games for Android by following the "More by Games For Girls" link! Our applications are paradise for dressup lovers: they are completely free, without inapp purchases. Also, no wifi or internet is needed to play. Download all our virtual doll simulators to your phone or tablet and check regularly for more! Please review Fashion Diva Dress Up Fashionista World Game and submit your comments below. We will collect all comments in an effort to determine whether the Fashion Diva Dress Up Fashionista World app is reliable, perform as expected and deliver the promised features and functionalities.